I would never have guessed that this day would arrive. A day that involves driving a shining new Ferrari through one of the most crowded cities in the world. Wondering why? Why would someone drive a Ferrari, of all cars, in a city that is more populated than a few countries put-together? Well, it's anniversary time and we just had to drive a Ferrari. It was initially a drive in and around Dubai mostly on empty and straight stretches of tarmac. But then that's not the driving environment we normally find here in India, so we decided to get behind the wheel of a Ferrari right here in Mumbai. It made more sense. How else will we ever know then if this red machine is practical enough for India? Only OVERDRIVE can tell you this. Let's head straight to the Ferrari dealership then! Only recently did Ferrari set-up a new dealership in Mumbai, but everyone seems to know where to find the prancing horse. After all it's one of the most widely recognised brands in the world. It's a swanky set-up located in the financial district and you can't miss it, thanks to the machines parked inside. 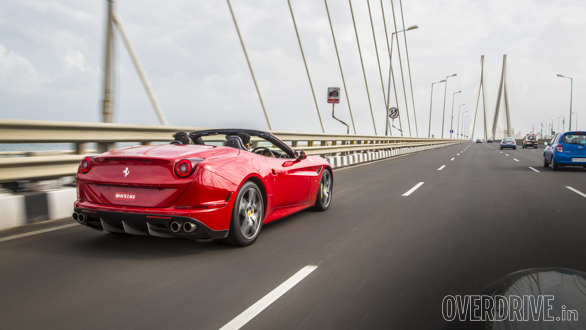 While we would have loved taking the 488 GTB supercar out, it made sense to choose the more practical California T. The two-door convertible has been around for some time now, but the T is the updated variant that's improved in almost every aspect. It's the first Ferrari to feature a turbocharged engine (hence the T) since the F40 and has set the path for the various forced induction Ferraris, including the 488 and yet to be born models. Surprisingly, unlike most carmakers taking engine downsizing seriously, Ferrari has continued to offer a V8 motor despite the addition of a turbo! This makes the California quicker and a lot more powerful than before. Power has gone up by almost 100PS to 552PS, and torque is now up by a massive 49 per cent. I did drive the previous car briefly a few years ago, and the T is definitely a very different breed in comparison. It still sounds loud and angry like a naturally aspirated V8 but enjoys the benefits of a turbo! It's actually two cars rolled into one. Drive it with a gentle foot and it can shuttle you around in town like a luxury car. Step on the throttle and the V8 sitting in front of you makes the car shoot forward instantly, like a supercar. It may not be a Grand Tourer, but it feels just as comfortable in town. Driving the car in the urban world is actually quite easy and effortless. 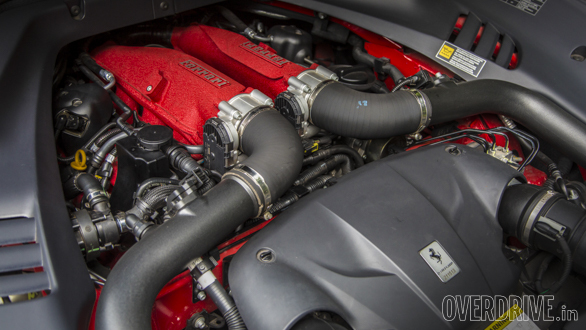 In fact, Ferrari claims to have put in a lot of effort to make this turbo motor behave more like a naturally aspirated unit. In Comfort mode, the steering is light and doesn't require much effort, especially in the city. 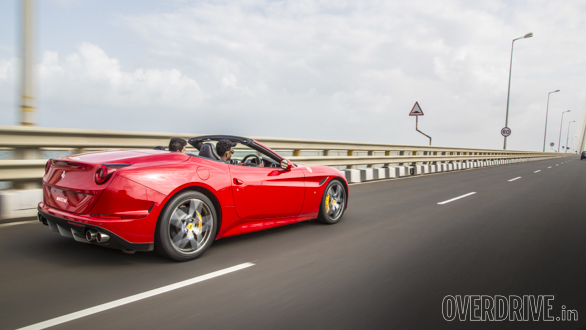 I decided to take a familiar route to South Mumbai and the California wasn't complaining. Short bursts made the drive entertaining, but I had to watch out for speed breakers and broken sections. But I soon realised that this is where the California T shines. 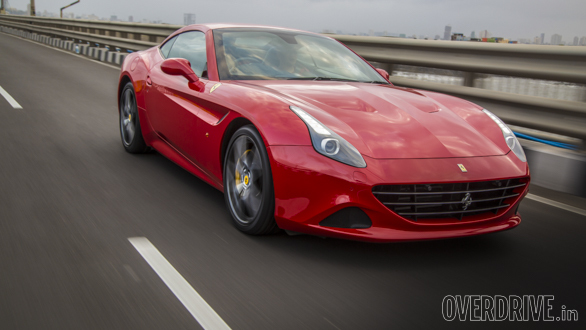 It isn't as low as the other Ferraris and can tackle these urban obstacles with ease. I was amazed at the car's ride too. It soaked up the undulations well, and never was I worried for the car and its bodywork. 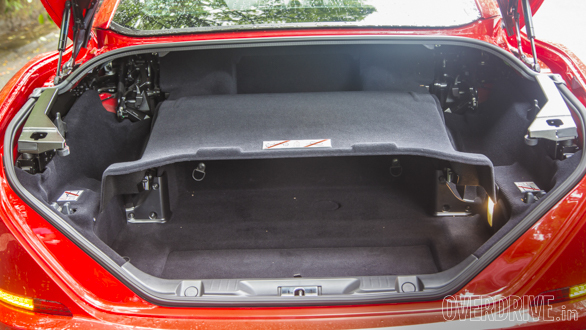 There's even a bumpy road option that sets the damper to a more comfortable setting. The long nose and lower seating position are the only reminders that you're seated in a sportscar. Besides, you are seated behind the half way point of a car that is 4.5-metre long and that takes time getting used to, especially when driving around town. As I said earlier, this California is a lot more powerful than before. It can rocket to 100kmph from standstill in a claimed 3.6 seconds. 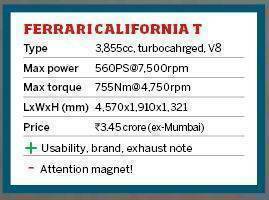 There's a mind-blowing 755Nm of torque on offer despite which it can be driven like a smooth luxury car, if needed. This makes it ideal for a market like India. Since I was in no hurry and was enjoying the easy-going nature of the car, it gave me time to appreciate the interior and the attention to detail. A Ferrari cabin is very unique and makes you wonder why other carmakers haven't taken a similar approach. But then this is what sets it apart from the rest. The handcrafted interior combines modern features with a classic approach. 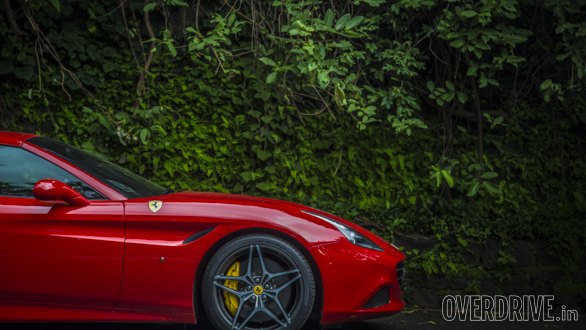 There's leather almost everywhere  all in a red theme in the car you see here. 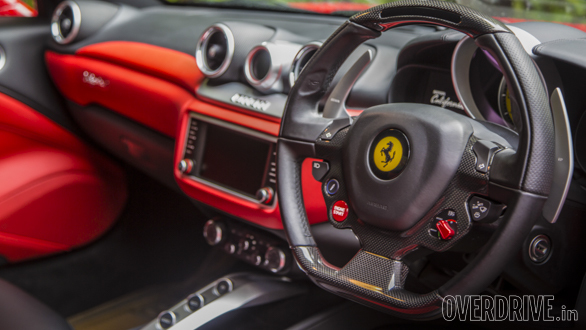 The multifunction steering wheel is another Ferrari trademark. It's a one-of-a-kind wheel and is inspired by a F1 car with proper shift lights and everything placed on the upper rim. There are no indicator stalks, instead there are two buttons on each side of the steering. Then there is this single button with a two-way operation for the wiper. It works brilliantly and one gets used to it in no time. The large fixed paddle shifters remind you that you're in a Ferrari! Then there's the button that I was waiting to use, the one that converts this hard top coupe into a cabriolet! The transformation takes only 14 seconds, so you can always get back to coupe mode in a jiffy. But then driving with the roof open brings you that much closer to the real motoring experience that this Ferrari is meant for. You feel exposed to the elements, and that makes you feel one with the automobile. You can't deny that. Since this is one of those very few Ferrari convertibles you can get today, with the roof down, it's an even better sound experience and adds more character. The V8 growl is louder and that quad-exhaust sounds like a thunderstorm. You want to keep driving with the roof open as long as you can. Luckily my date with the Califronia started early in the day, and I made best use of the time before hitting peak-hour traffic. By the end of it, I was convinced. The California T is the most practical Ferrari available today. 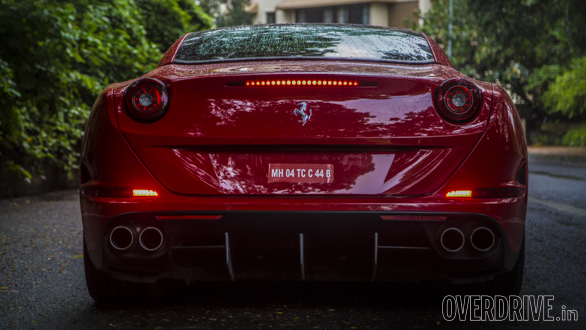 It's an all-rounder, if you ask me, and is the most usable prancing horse for India. It drives like a luxury car even on Mumbai's roads, has the power to match most sportscars, is a coupe as well as a cabriolet, offers comfortable seats and lots of storage space, and even gets a decent-sized boot (the rear seats fold too). 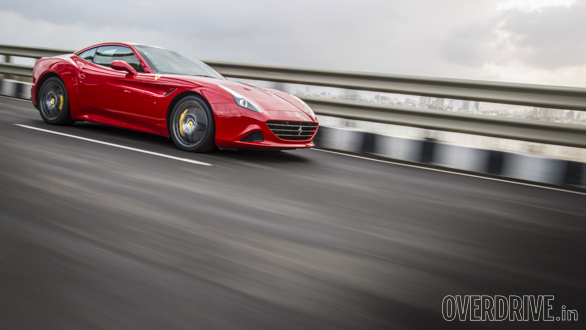 Most importantly, it is one of the finest cars to have rolled out of Maranello. The California T truly represents the brand in one of its most complete packages.